So The Legal Genealogist picked up some new cousins this week. Well, not exactly new, of course, but newly discovered, thanks to DNA. One is Gary. He lives in Texas, and he’s a third cousin once removed. His second great grandparents — and my third great grandparents — were Daniel and Margaret (Battles) Shew of Cherokee County, Alabama. And Gary was kind enough to agree to DNA testing. His results are now fully in — and they’re both frustrating and delightful. Frustrating, because we had some hopes of a clear-cut YDNA answer to the origins of our first-known ancestor Phillip Shew of Guilford and Wilkes Counties, North Carolina — and we didn’t get that. He’s not a YDNA match to pair of cousins who appear to have a good paper trail back to a German settlement in Pennsylvania. 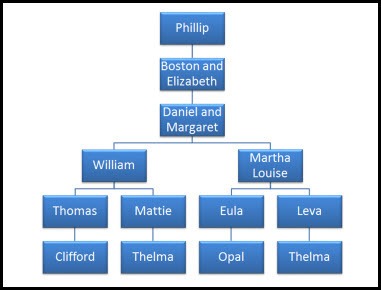 We’re going to have to do more work on trying to trace Philip’s origins. Delightful, because his autosomal DNA results are just what we would have expected given the paper trail research. He matches my grandmother’s first cousin (his second cousin once removed), he matches both of my uncles and both of my aunts who’ve tested and their first cousin (his third cousins), he matches my first cousin, my brother, my sister and me (his fourth cousins). And, thanks to Gary’s willingness to be DNA-tested, we’ve picked up cousin David. He also lives in Texas, and he’s a fourth cousin to me and a second cousin once removed to Gary. We’ve already started sharing information about our common ancestors and hope to be able to fill in some gaps for each other in our research. Gary and David both match Anne, who’s a double-cousin (Daniel’s brother Simon married Margaret’s sister Sarah and Anne descends from that Simon-Sarah marriage). And they both match another cousin who descends from Margaret’s and Sarah’s sister Hattie Elizabeth who married Jesse Cranford. Because everyone whose paper-trail research I’m familiar with so far is either only on the Battles side … or a descendant of one of those Battles-Shew double marriages. Nobody, yet, whose paper-trail research is solidly — and exclusively — on the Shew side. That frustratingly elusive Shew side where we didn’t get the YDNA match we were hoping for. There’s a bunch of folks who match some of my kits… and who match Gary … or who match David … or who match some of my kits and Gary and David. And they’re not on the Battles side at all. They’re solidly North Carolinians… Wilkes and Guilford Counties, to be precise … with Shew in their list of ancestral surnames. So — never satisfied — we’re off to contact those Shew descendants from North Carolina. To see how — and if — their paper trail and ours comes together. And if that doesn’t work… and maybe even if it does … there’s always the chance of getting a Shew-only match with a descendant of one of Daniel’s siblings who didn’t marry a Battles. And there are some: brother John had descendants who were in Arkansas, and there are two half-brothers (William Boston Shew and Jefferson David Shew) who both left descendants we can try to track down.